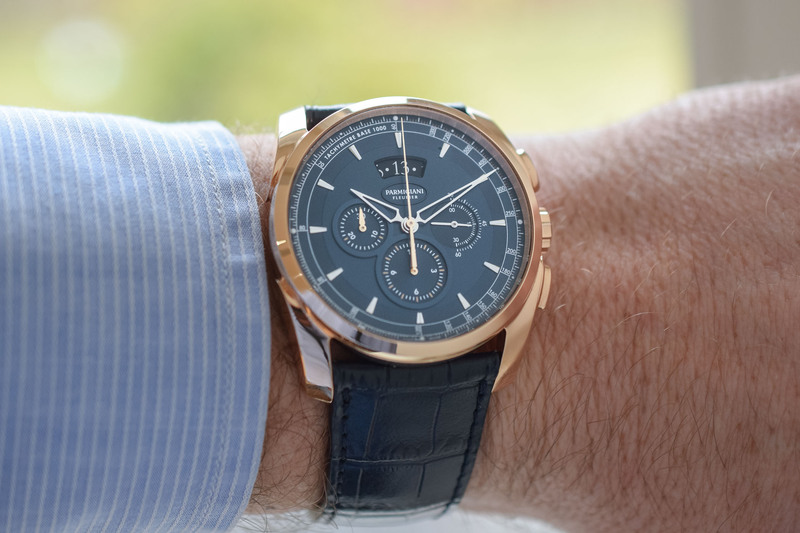 An early hands-on look at Parmigiani's latest Metrographe in pink gold with a blue dial. 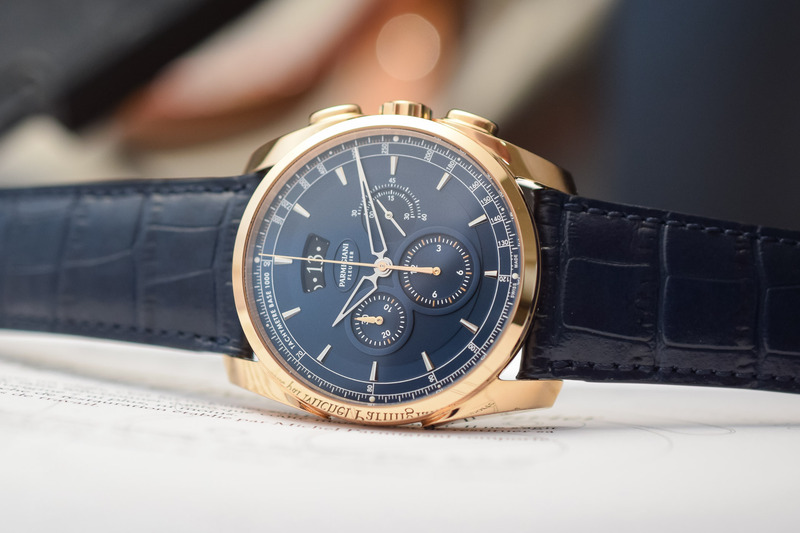 When Parmigiani Fleurier launched the Tonda Metrographe (this version) in 2014, it wasn’t love at first sight. 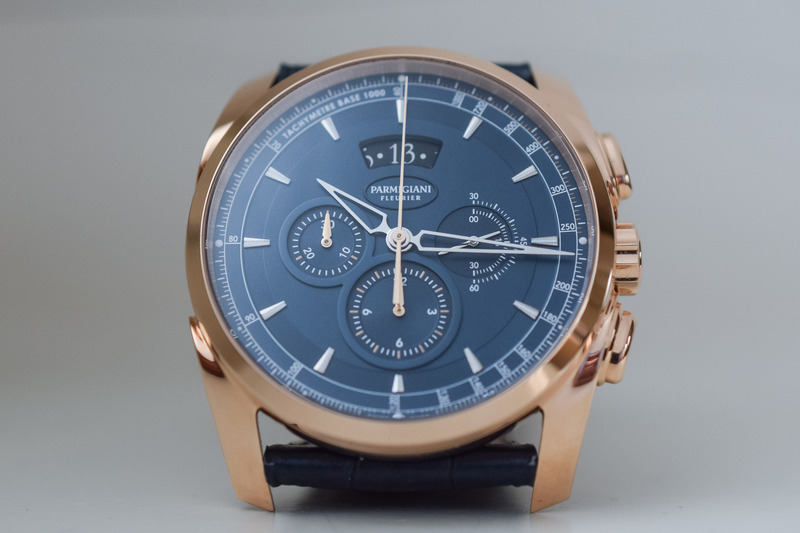 Although there was a lot to like about this new Parmigiani Chronograph – its distinctive yet elegant case design and the traditional overall quality of Parmigiani – somehow I felt it was not a watch I’d like to wear… at least until the brand presented a tasteful facelift of the collection at SIHH 2017, with redesigned dials. Small things can make a big difference. 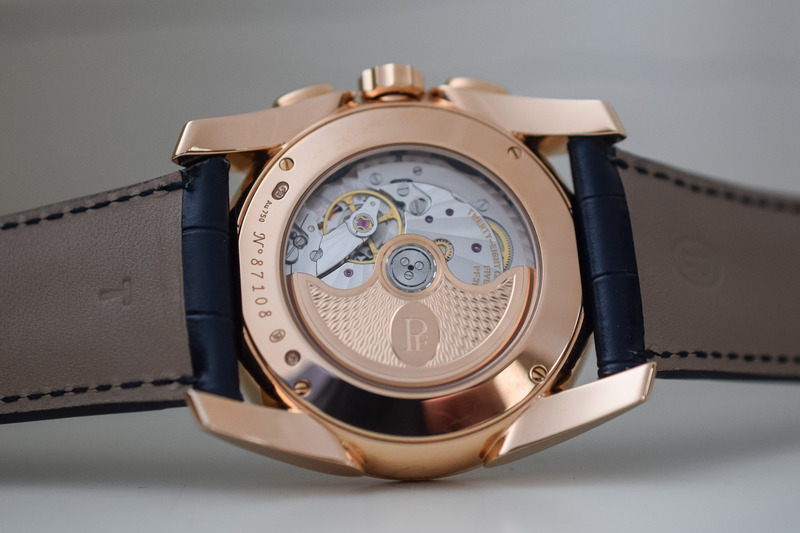 The Fleurier-based manufacturer now adds a blue dial and pink gold version to the Metrographe collection that underscores its good looks perfectly. Featuring a blue-opaline finish, the nicely crafted three-register dial is in the same vein as the models introduced at SIHH 2017. The chronograph sub-counters feature a flinqué pattern and form a figure eight (a signature Parmigiani design) delimited by raised sectors. The double-sided small seconds hand at 3 o’clock is a nice touch. The short facetted rhodium-plated hour markers are paired with openworked hours and minutes hands. The large date aperture displays odd numbers only and is located at 12 o’clock, on top of the brand’s oval logo. A snailed pattern at the periphery of the dial adds to the overall sense of depth while the tachymeter scale underscores the sporty yet elegant touch. With its 40mm diameter, the asymmetric 18k pink gold case features curvaceous lines and prominent tear-drop lugs, almost giving the impression of a cushion-shaped case with a perfectly round opening for the dial. 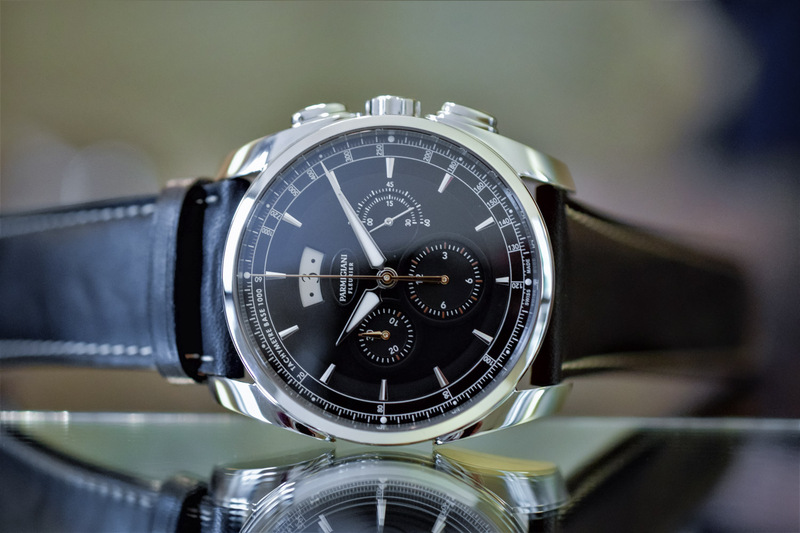 The crown sits in between dynamic oval chronograph pushers. It is nicely polished all around. The sapphire case back is secured by four screws. Water-resistance if of 30m. 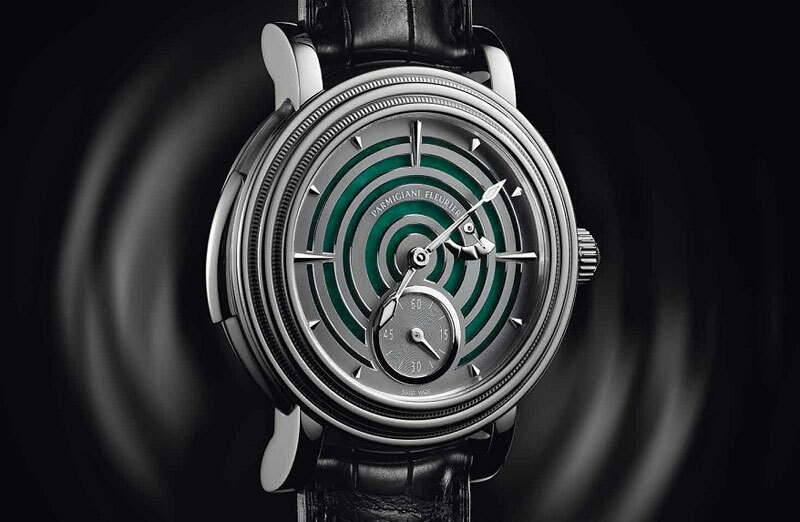 Inside the Tonda Metrographe is Parmigiani’s automatic calibre PF315. 28mm in diameter, this modular chronograph operates at 4Hz with a 42-hour power reserve (on two barrels) when fully wound. The balance wheel features four adjustment weights. The exhibition caseback reveals its refined finishing, including perlage, Geneva stripes radiating from the balance wheel and a 22k gold rotor with a grains d’orge guilloché pattern and a PF logo in an oval crest. The Parmigiani Fleurier Tonda Metrographe is worn on a superb Hermès Abyss Blue leather strap with a gold pin buckle. 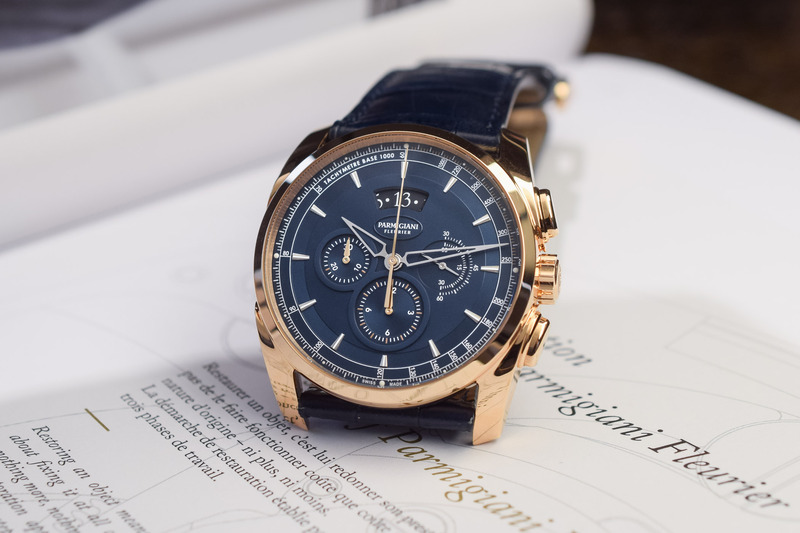 This elegant and versatile chronograph has great wrist presence. It is comfortable on the wrist despite feeling larger than the 40mm diameter suggests, mainly because of its prominent lugs. Retail price is set at CHF 29,500. 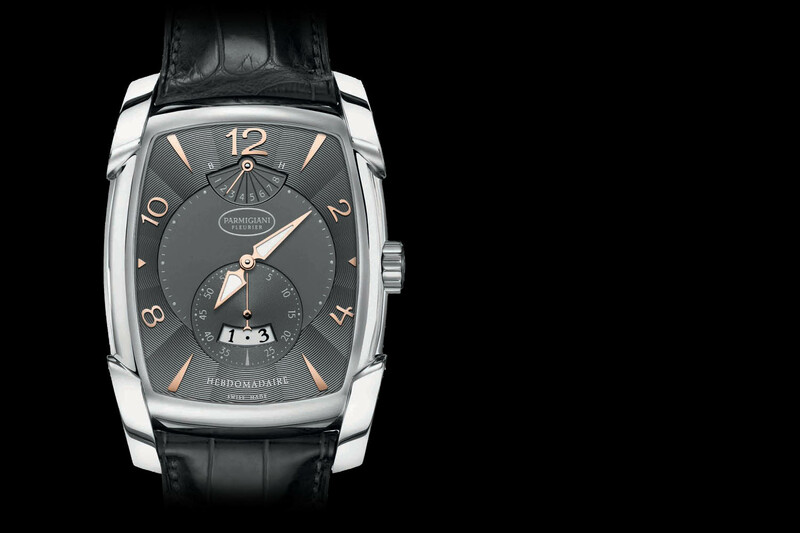 For more information, please visit parmigiani.com. 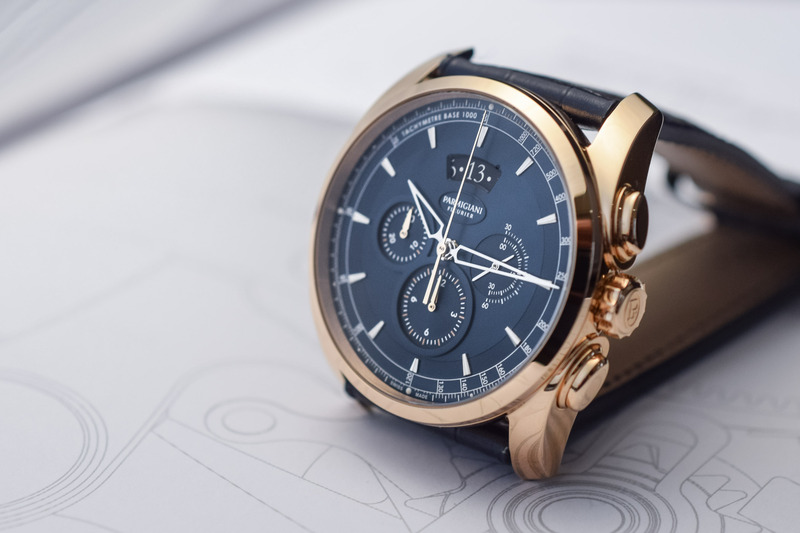 The base design seems good, but, to my eyes at least, blue dials just dont work with rose gold; yellow gold or, preferably, white gold works much better. 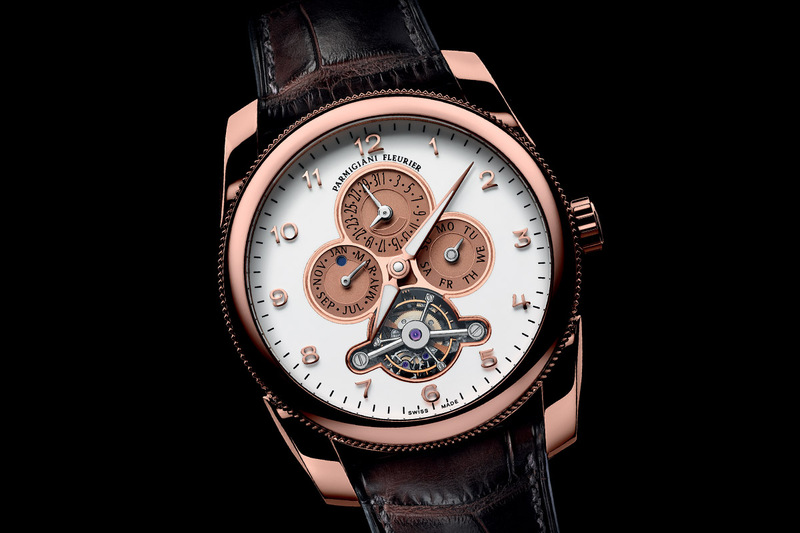 Rose gold really comes into its own with black dials. Still, each to his own. Is there any discrepancy of the caliber used in this reference? Is it a Cal. PF315 or PF350 mentioned below the sixth photo? Seeing is believing. If Cal. PF315 is correct, then Parmigiani had also made a mistake on the number of jewels – 46 on description vs. 28 on the photo used on their webpage. @Albert we’ll double check with PF. The press release and website mention cal PF315. The watch we shot and the pictures of the movement on their website show 28 jewels. @albert PF advised the base caliber has 28 jewels + 18 for the module.